The doors to the Ayyappa temple in Kerala opened on Monday for the second time in three weeks for the two-day Chithirai Avittom Pooja amid unprecedented security over apprehension of protests by those opposing the Supreme Court order allowing women of all age groups into the shrine. The temple, which opened at 5 pm today, will remain open till Tuesday night. Tension prevailed in Erumley and Nilakkal on Monday morning after police refused to let devotees into Pamba. 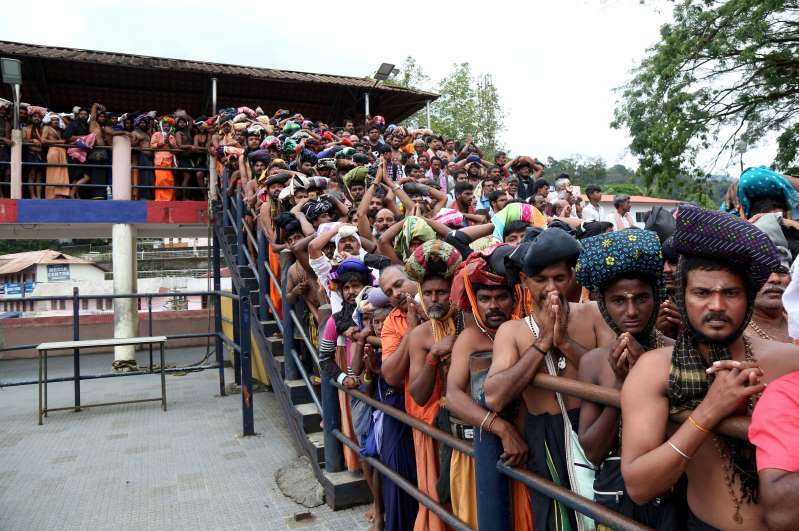 The devotees were sent to Pamba only by 12:30 pm. As part of security arrangements over 2300 police personnel were deployed in and around Pamba and Sannidhanam. This was in addition to 2 companies of Indian Reserve Battalion and women police battalion. Police said a 30-year-old woman had reached the base camp at Pamba along with her husband and two kids. However, the woman, Anju, a native of Cherthala in Alappuzha district, told police that she was not keen to visit the shrine and admitted that she had come to Pamba following pressure from her husband, Abilash. For the first time ever, women police personnel, all of whom were above the age of 50 years, were deployed at Sabarimala Sannidhanam. Following violent protests that took place last month, Pathanamthitta district police officials confirmed that an all-woman battalion has been stationed at Pamba. A video of Kerala BJP chief PS Sreedharan Pilla surfaced on Monday in which he allegedly said that the Sabarimala issue is a 'golden opportunity' for the party. He also claimed that the chief priest at Sabarimala had called him when women were being taken to Sabarimala. The opposition slammed the BJP after the video emerged, alleging that their communal agenda has been exposed. The temple had witnessed high drama last month following protests leading to around a dozen women in the age group of 10-50, including activists and journalists, being prevented from reaching the sanctum sanctorum of the temple even as the police and the agitators fought a pitched battle over the LDF government's decision to implement the court order. Meanwhile, the Sabarimala Karma Samiti, a platform of right-wing outfits, including VHP, has appealed to media houses to not depute women journalists in the menstrual age group to cover the developments in Sabarimala.